Lemon, ginger and honey jam is based on old remedies. A teaspoon in hot water or tea would work miracles. It’s also a very good glaze for poultry and seafood. 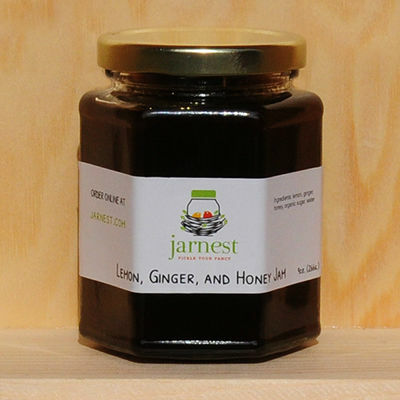 Jarnest preserves makes small batch, homemade preserves including jams, pickled vegetables, chutneys, and salsas. We try to use as much local produce as possible to support our local farmers. Preserving is a great way to enjoy seasonal fruits and vegetables all year round. At Jarnest, we do so without using manufactured preservatives. Plus, we love experimenting with new recipes and combinations to keep everyone satisfied. Only sold in 9oz jars. Check our schedule on https://jarnest.com/pages/schedule to find us at various locations!